My grandfather taught me how to shave when I was only nine years old, long before I needed to know. The first lesson hadn’t been his idea; he had been quietly complaining to my grandma that he was itchy, but she had to make it to the post office before it closed. On her way out the door, she fetched his dopp kit from the bathroom and suggested he teach me how. The shaving kit was many times older than I was then. Its thick leather walls were burned dark with the cattle brands of the ranches he had worked on. It was closed with a stout brass zipper with vicious, pinching teeth. He couldn’t sit up by himself; the shaking in his legs caused him to slouch in the seat, spilling onto the floor until somebody bigger than me was able to pull him back into it by his armpits. As a young man, he had stood taller than I do now. But the disease took his legs first, long before I can remember. His chair in the living room was wrapped in burnt orange velvet and draped with loose-knit Afghans. Underneath, it sat on a bed of hydraulics that lifted and tilted the seat forward to get him out of it at night. When he was in bed, I would ride the chair up and down, pretending it was a rocket ship. The first few lessons were slow, but soon I began to look forward to afternoons when my mother worked late and the school bus stopped in front of his house. Running up the steps and into the living room, I would find him propped up in front of the snowy television set. If I was lucky, my grandmother wouldn’t have had time to shave him that morning, and I could climb onto his lap to slowly scrape the gray whiskers from his face while his hands trembled in waves. The fancy shave gel my father used came out of the nozzle in thin green snakes that he worked into a weak lather, but Granddad preferred an old brand in a striped can. Pressing the large button on top, I would fill my hands with foam that rushed out in enormous, white pillows. The cream smelled clean and vaguely chemical. He told me how to dab it on, spreading it as evenly as I could manage, but I always used too much. Sometimes, I smeared enough on his face that it covered his nostrils and he had to wheeze through his mouth until the shave was done. He was quiet while I worked, holding his chin high away from his body still I whittled away at the turkey skin of his neck, and tucking it low against his chest so I could reach stray hairs high on his cheeks. Unlike the rest of his body, his head and neck stayed perfectly still, and his jaw was always rigidly set. 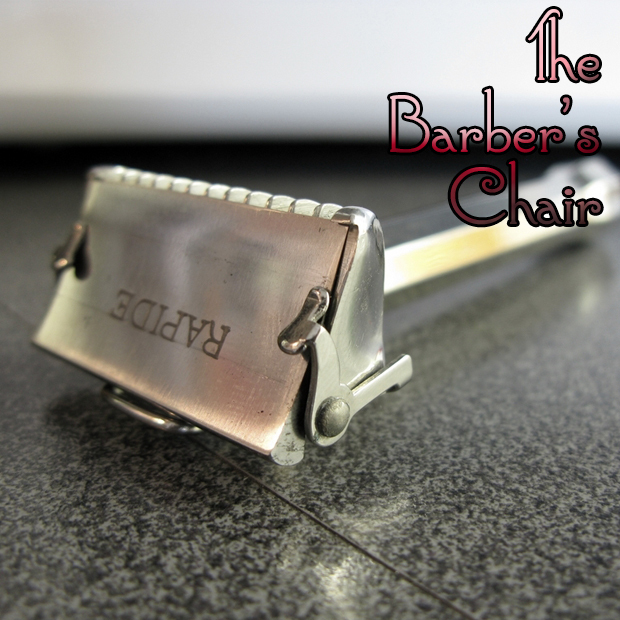 I struggled to hold two-blade safety razor at the right angle and usually had to go over the same spots again and again to get the job done. After each long stroke, I would swish the razor in the bowl, freeing the silver whiskers to float down through the murky water. Rarely, I would get in a rhythm, leaving several clean passes in a row along his jaw. But it was only a matter of time before I would gash him, and a small pocket of red would slide down his face, mixing pink with the cream and water. Eventually, I would finish with one final pass by his right ear. Satisfied with my work, I rinsed the razor for the last time, and toweled him off with an old brown rag my grandmother kept wadded in the shaving bag. As I scrambled off his lap, tepid water from the dish would slosh onto him, leaving dark patches in his smooth, uncreased trousers. , I repacked the bag at his feet with all my tools before telling him I loved him and running outside to play in the dirt behind the house. I didn’t know to plug his nicks and cuts with tissue, and he never said anything about it. While the afternoon sunlight drained from the room, he watched whatever program I had left on the TV and the bloody spots on his neck dried into dark red blossoms.